Do we do transports? Hiking or Canoe? How much? Yes! Both, within reason. We don’t want to be driving all day, so within the Gunflint Trail we’ll haul you, your gear, and even your canoes from point A to point B. Let’s say you want to put your car at your exit point and want us to drop you off at the start. No problem. For entry points along the Gunflint Trail, transport starts at $40, additional charges for large groups or multiple trips. Do we have a restaurant? Breakfast? Our restaurant closed in 1999. It was a full service, high end restaurant serving nice meals that people would drive a long way to enjoy. We have no current plans to open the restaurant for the general public. We do have plans on making breakfast available for both our outfitting and cabin guests, but first we have to upgrade the kitchen to meet codes. There are a lot of restaurants in this area of the Gunflint Trail to enjoy, and each of our Cabins has a full kitchen for you to prepare your own meals. The bunkhouse guests can use our grill and picnic shelter by the lodge to prepare meals, but no cooking is allowed in the bunkhouse rooms themselves. Is there a Guide service available? Fishing or Boundary Waters? Yes and no…we have a fishing guide that we refer people to, and he’s quick to answer questions via email or phone calls. He is for hire and you can plan trips with him, his name is Adam Treeful and in the winter he has a dogsled team that competes in area competitions. Both Mike and Carl (two of the four owners) can be convinced into being a guide for the BWCAW. Again, we are busy running the resort, but if the situation is right (read: $$) we’d love to go camping with you. There’s an awesome guide service available through Rockwood called “Border Lakes Tour Company” – their trips are designed to meet your comfort level. They can range from easy to challenging based on the type of experience you are seeking. Your guide will discuss this with you and find the right hike or canoe route to meet your needs. If you just need help getting started, finding the portages / campsites, learning how to canoe or set up a tent, that’s all free and included in the cost of renting a canoe! What is the Boundary Waters? How can Rockwood help me? I don't think I'm ready for a trip in the Wilderness. What's available for me? Before you write it off completely, try “day trips” and see if you indeed have the chops necessary to enjoy the wilderness. Rent one of our cabins for a couple of nights, and spend the day in the Boundary Waters! Bring a lunch, paddle a couple of lakes in, and return to spend the night in a real bed. I think you’ll be amazed at your own abilities and will be itching to try a longer, overnight trip in the Boundary Waters. My recommendation is to find a couple of friends / family that have a similar interest and put the power of a group into this experience. Also, learn how to portage a canoe (hint: Kevlar canoes weigh 2/3rds the weight of an aluminum canoe) because canoes are often lighter than some packs! If you are unable to convince others to join, consider a solo trip into the BWCAW. We have an “inReach SE” device available for rent that allows worried families back home to watch your progress on a web page, and gives you two-way texting over Satellite communication. It also makes your smartphone into a great GPS for navigation, and easier texting to loved ones. Send more than “I’m okay”, and get real feedback to know your message is received. We have four solo canoes and all the smaller, lighter gear you need to make it as easy as possible. Let us provide and pack the gear (and food) and you don’t even have to do planning! I've got a lot of gear but I'm not sure if I'm ready for a BWCAW adventure. We rent all the gear you need to fill in the pieces. We offer routing service and planning, and have three different brands of waterproof canoe maps for our areas. We can show you how to use all the gear, even those crazy tents and propane stoves, safely. We love this area and think you will, too. How often do you wash your sleeping bags? All of our sleeping bags are freshly laundered between uses. This is what our Bunkhouse is made for! We have four rooms that each have their own shower, toilet and sink. Each comes with 4 bunkbeds and an optional roll-away cot, for a maximum of 9 people in each room. They all have heaters and are furnished with towels, but you have to provide the sleeping bags and pillows. Sorry, two nights is our minimum for any of the cabins. Some places on the trail require three nights. Do you allow pets? What do we do with our pet when we are enjoying the area? We do allow pets. There’s a $25 fee per pet for your stay in the cabins, and $10 fee for a pet in the bunkhouse. If you’ll be away and plan on leaving your pet in your cabin, please let us know so we can watch over them. We’ll even offer to walk your pet and let them get fresh air if needed. There’s no restriction on pets in the BWCAW. We’d recommend a floatation jacket and practice with your pet in a canoe before committing to the adventure. There are wild animals in the BWCAW so you’ll need to keep control of your pet. Don’t forget some basic pet first aid items in your addition to your standard first aid items. Other campers are out there for quiet, so a barking dog will not be appreciated. And please pick up after your pet, even in the BWCAW. Motor boats on Poplar? I thought you were in the BWCAW, and they don't allow motors. Poplar Lake is outside of the Boundary Waters (well, one small tip shows that it is in the BWCAW on some maps). There is no horsepower limit on Poplar Lake, so bring it up! We have a boat launch in front of our outfitters, but it’s gravel and has bumps. If you want a nice, smooth concrete boat ramp, there’s a public one a mile to the West. If you are staying in a cabin you can bring your own boat. Several of the docks at the cabins are shallow, so you may need to park your boat at the ones in deeper water, next to the lodge. All boats are subject to Aquatic Invasive Species, so we’ll ask some questions and check your boat and trailer. We can help you practice. Orientation with the maps we sell are based on finding campsites and portages on the map and then in front of you in the real world. It’s pretty simple once you get the connection; the red dot on the map for the campsite is a clearing with a fire grill in it. The red dashed lines that indicate portages is the only break in the trees on the side of the lake, and it’s really dark where the portage goes into the woods. The sun comes up in the East and sets in the West. 🙂 And there are other canoers out there who want to help you find that next portage! How do people contact each other in the BWCAW? Do I need a satellite phone? Why can't I be connected? You can have internet in the Boundary Waters, but you’ll pay a premium to have a satellite connection. There is no cell service in our section of the BWCAW, at all. We do rent the inReach SE, so you can text with your family and they can see a GPS map of your location. You can rent satellite phones and have them delivered here the day before your entry date. Most people, however, just simply tell us their route, and we know when to expect you. While you are mostly isolated from other groups in the wilderness, there will be canoes that pass by your campsite several times a day. If you overstay your exit date, we’ll check with other canoers in the area and begin a search! In the event of a dire emergency, (usually unforeseen medical) there are several volunteer and government agencies that rescue people in the BWCAW. Usually this is very disruptive to everyone in the area because they often have to use motors to conduct the rescue, so only actual emergencies should be declared . Drones? Sails? Emergency radios? What are the dos and don'ts of the BWCAW? I like having a small emergency radio to listen to forecasts in the BWCAW. You often have to bring a length of wire to get a clear signal, but it’s helpful when you see a wall of clouds approaching and need information. Drones are NOT allowed in the BWCAW. Period. No mechanical means of propulsion is allowed either; no creating a large sail and having the wind do all of the work! 9 people is the max group size, no matter the number of permits or outfitters you use. 9. No more. Late checkins? It's a long drive from __________. Yes! We know it’s a long haul from lots of places to here. And there’s a lot of distractions (waterfalls) on the way up to spend time. Just let us know beforehand and we’ll give you instructions on how to check in after hours. No worries! What's included in the Cabins? Firerings? Firepits? What is in the kitchen? What do I need to bring? Each cabin has a full kitchen (Refrigerator, stove, sink, microwave, coffee pot) and most of the utensils / pans / bakeware you may need. Each has a 3/4 bathroom (shower, toilet, sink) and some have fireplaces. Each has a canoe (free use of paddles and life vests available at Outfitting), outdoor charcoal grill, picnic table, parking, a deck and a dock. There are firepits/firerings at three of the cabins (cabin 2, 6, and 7). Some additional kitchen items are available in the lodge, please inquire if you don’t have something you need. Some bedrooms have shelves and some have dressers, depending on the cabin. Contact us before hand if you have a specific question on the furniture in each cabin. You can also check the detailed floor plans on each cabin’s website, and the photographs for clues as well. You’ll need to bring food and condiments, salt, pepper, coffee, coffee filters, ice, bottled water, charcoal, firestarter and firewood (don’t transport firewood from outside of the forest into the Superior National Forest; there’s several places here that sell it, including one very close to Rockwood for only $5/bundle). Do cell phones work? Where's your wifi? Does Verizon / AT&T / T-Mobile / Sprint work? There’s no cell service on the Gunflint Trail. None. Nope, not with Sprint / Verizon / AT&T / T-Mobile, none of them. Within 5 miles driving north from Grand Marais your phone will not work. Put it down and focus on the narrow, winding road with lots of wildlife! We have high speed wifi (100mbps) and you can turn on the wifi-calling feature of your smart phone, or use skype or facebook messenger to call. We also have wifi at the Outfitter’s building, which reaches to the bunkhouse. Do you sell fishing licenses? 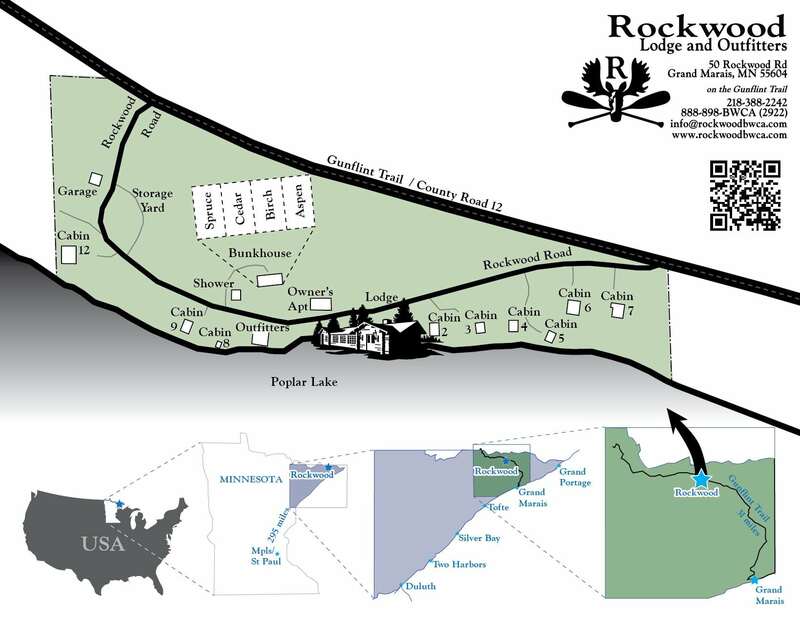 Can I pick up my BWCA permit at Rockwood? We can sell fishing licenses through MN DNR’s website. We can print those licenses on 8.5×11 waterproof paper, but they don’t look like the small thermal waterproof licenses sold at Holiday, so if you want a small one visit a Holiday station-store on the way up. If you’ve never had a fishing license before we’ll probably need your social security number. BWCAW overnight permits (both canoe and hiking) can be printed here. You’ll need to designate “Cooperator-Rockwood Lodge & Outfitters” when booking your permit, or you can log back in to recreation.gov and change the pickup location. You’ll need to watch the same video and go through the same quiz that you would at the Forest Service. New in 2019 EACH person will need an email address, the video is in 3 parts. The first video is watched when you make the reservation, the next is a few days before you travel to the BWCAW, and the third is watched here or at the Ranger station. Prices have changed slightly; $6 for the permit, $16 for each adult, $8 for kids 17 and under, and there are discounts for senior citizens. Group size is limited to 9 people and 4 watercraft, NO MATTER how many permits you may have. We can issue motor permits as well, because in certain parts of the BWCAW it’s legal to have a motorized boat. Day permits are no cost and available at the front desk and at the Outfitters. Again, we ask guests to follow all the rules of ‘leave no trace’. Do you have parking? When is parking included in the cost? Parking at Rockwood is $5 / day / vehicle. If you have a rental with us, one of our packages or just a canoe rental, or are staying in the bunkhouse we allow you to park your vehicle(s) during your trip into the BWCAW for no charge. Either way we do request that you check your keys at Outfitting. Linen and towels - how often are they changed? A nice supply of kitchen and bath towels, based on your group size, is provided when you check into the cabin. We ask that our cabin guests stretch the days between laundering the towels, but if your towel is dirty or you just want a fresh one, please contact us and we’ll switch them out for you. We do not provide fresh towels daily. The sheets and bed covers are washed between each cabin use, and can be changed out for our guests that are staying for longer times. We provide pillows, blankets and linens for the fold out couches and futons as well. Let us know as soon as possible if you have more people in your party than originally planned. Please let us know if you need items changed. Our bunkhouse guests and shower house guests each get one towel for their use. The shower house also has shampoo and conditioner for your use. Do you have Kayaks and Stand Up Paddleboards? We have 7 kayaks (all solo) for use on Poplar Lake, you can rent them by the half day or full day, each comes with a life vest and a kayak paddle. Three of them are 14.5′ Tsunami 145s by Wilderness Systems, we have a Kestrel 140 and a Kestrel 120, a fishing kayak Wilderness Systems Commander, and a 9.5′ Old Town Heron XT. New this year – Stand Up Paddleboards (C4 Waterman Classic X 10.5′) – We are having 2 delivered in May, and are looking forward to enjoying Poplar Lake while getting a core workout. Do you have leeches? Do you have live bait? Yes! We have leeches and crawlers from mid May through September. Leeches are $4/dozen and $40/pound, Nightcrawlers are $2.50/dozen. There’s an awesome bait shop in town called “Beaver House” and another one on the trail 2 miles from Rockwood called “The Ugly Baby”. Microwave? Pot to boil water? Yes, our cabins all have microwaves and pots for boiling water (on the stove). Some pots are bigger and some are smaller, based on the cabin size. When you get into your cabin and you notice you are missing a certain size pot or pan, ask us and we’ll check our inventory to see if we have one you can use. Grilling tools? Do I need to bring charcoal? Our cabins have grills and basic grilling tools. We do not supply charcoal or starters, you should bring those. Do you have mosquitoes? Do you supply a bug net for the picnic table? Like most of Minnesota our mosquitoes are large and in charge. You’ll want to use bug spray if you are outside for an extended period, hiking or portaging between lakes. Early spring and late fall are great times to stay up here, the mosquitoes are much slower or are completely gone! Our cabins do not come with a bug net that fits over the picnic table. You can bring one if you want. I see there is a canoe with each cabin. Do I need to bring an extra canoe? You can use as many aluminum canoes, kayaks and paddleboards as you want when you are renting a Cabin. We ask that you return them back to Outfitting when you are not using them, don’t leave them at your Cabin. Maximum group size in the Boundary Waters is 9 people and 4 canoes, but Poplar Lake is not in the Boundary Waters and there are no such limits. Thank you! Can we tube on your lake? Waterski? Jetski? While many people enjoy going fast in motor boats, jetskies, waterskies, tubing and other high speed watercraft, it’s not what Rockwood is known for; we pride ourselves on being on the edge of the Boundary Waters Canoe Area Wilderness. We have a lot of wildlife and waterfowl in this bay. Please be considerate of others and leave Poplar lake for fishing and paddle sports. Do we need to bring lawn furniture? Outdoor chairs? Life vests, paddles? Your cabin rental comes with enough outdoor furniture for the number of people you planned to bring up. If you bring additional people, please let us know as soon as possible and we’ll get the additional furniture to your cabin. As a full featured canoe outfitter, we have a lot of life vests and paddles. If you have your favorite one, please feel free to bring it. Otherwise, stop by outfitting and borrow some of ours. We do not store them at each cabin. Where should I clean the fish? Do you have a fish cleaning house? Our fish cleaning house located near the main dock, back by the tent drying racks, behind the webcam, is the best place to clean your fish. We ask that you refrain from cleaning fish in the cabins. Not everyone enjoys the fish smell and it is rather hard to remove between rentals. We have a large group staying in one of your bigger cabins. Do you have enough ______? Our cabins are completely stocked with enough furniture, outdoor furniture, towels, linens, pillows, pots, pans, plates, and silverware for the size group you told us you are bringing. If you plan on bringing more people, please contact us as soon as possible so we can prepare your cabin. Notice the max size on each cabin, that’s the number of people that can sleep in the cabin, some beds are made for two people. Just because the cabin lists a max of 8 doesn’t mean there’s 8 beds. Please check the floorplans, photos, or just give us a call and we’ll help you plan! There’s no air conditioning in the cabins. We provide several fans and can get you additional ones upon request. Cross breezes are key, and there’s a mighty big lake you can wade in or swim in to cool down. 8 people in one cabin, but the rate is set for 3. Why the difference? Q: According to the website, this cabin sleeps 8 people. I assumed that was how the rate was calculated. But when you sent me the description e-mail, you mentioned that my reservation was for three people, and in the bullet points below, it talks about an extra charge for adults or children. I’m kind of confused about this particular issue and it might be something that causes me to reserve somewhere else. A: Each cabin has a standard occupancy, and the rates are based on that many people. Each cabin also has a maximum number of people, and those extra people are an additional charge. For example, the rate for Cabin 2 is for up to 3 people. The cabin can have as many as 8. If you have more than 3, you need to pay for the extra people, different rates for kids and adults. Where is Cabin 1 / Cabin 8 / Cabin 10 / Cabin 11? Future plans! The layout of the cabin numbers has been this way for some time, so when we renamed the Owner’s Cabin into Cabin 12 we left room in the numbers for Cabins 10 and 11; the plan is that they’ll be between Cabin 9 and 12. Cabin 8 right now is an extra small boat house / storage building between Cabin 9 and outfitting. Cabin 1 is a storage building up on the hill, a very cute little Cabin that isn’t ready to rent. Some of our guests, who worked here in the past, used to stay the summer in Cabin 1. We have lots of plans for the future of Rockwood, but for now just keeping the existing Cabins ready for our guests keeps us busy busy busy!